You may have heard the news story that aired recently about an 11 year-old autistic boy who was having trouble on his first day at a special needs school. As the story goes he was so nervous that he climbed out his classroom window and began hanging over a 3rd story ledge. The school officials could not get the young child to come back into the classroom, so they called the fire department to come and help. Upon arrival, one of the firemen overheard the boy’s mother and teachers talking about how much he loved comic superheroes. So the firefighter ran back to the station to get his Spiderman suit that he uses in schools to liven up fire drills. 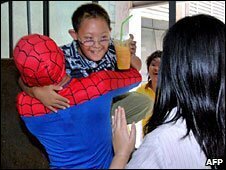 When the fireman showed up in the window wearing the Spiderman suit the young boy smiled, and climbed into his arms. He was rescued by Spiderman. When I read that story, I couldn’t help but think of the church. We are called by God to do everything we can to help save a life. 1) He didn’t wait around to get permission and approval from his fellow firemen. The situation was urgent, and the consequences of delayed action could have been tragic. He acted quickly and efficiently. Lesson: The consequences of people dying without Jesus are serious and tragic, so we need “a little less talk, and a lot more action.” What if it were your son out on the ledge? 3) His method of rescue was anything but your traditional fireman rescue. When the typical methods of rescue weren’t getting the job done, he went outside the box and did that which was necessary to accomplish his mission. Result: A young boy’s life is saved. Lesson: If what we are doing isn’t working, we need to stop. It doesn’t matter how sentimental, or fond we are of our method – if the mission isn’t being accomplished. Sometimes we lose sight of the mission, it is important to remember that the church is in the business of saving lives, not our way of doing things. May we use ‘all possible means’ to save some!